Had she still been alive, December 2nd 2018 would have been the 95th birthday of the most renowned opera singer of her time, Maria Callas. was warm, lyrical, intense; it swirled and flared like a flame and filled the air with melodious reverberations. At this age, Maria was a rather plump young lady with a rather deep voice. Initially, she aspired to be a contralto but at the Conservatoire she was encouraged instead to become a dramatic soprano. Accordingly, she underwent special training to raise her natural pitch (or tessitura) and learned how to control her remarkable voice more accurately so she could sing in a sufficiently disciplined fashion that she could take on the dazzling coloratura passages that she would perform in later years with such success. She also worked on her chest tones to broaden the scope of her voice in the mezzo region. Although she became more technically refined as a singer during this period, there were some things that didn’t change. One was the sheer power of her voice, which is something that we tend to notice less in these days of microphones and studio recordings. People who heard her sing live confess to being shocked at the sheer scale of sound she could deliver without amplification. Perhaps more tellingly, she eschewed many of the devices sopranos tended to use to control the highest notes, usually involving some alteration of the throat to produce accuracy at the expense of a thinner and more constricted tone. When Callas went for a high note, she always did so in a full-throated manner. This often produced a piercing sound that could be intensely dramatic, even to the extent of almost knocking you out of your seat, but it was a very risky approach for a live performance. Audiences simply weren’t used to hearing a coloratura sing with such volume and in such a whole-hearted way. It wasn’t always pretty, but it was certainly remarkable and often very moving. It was this aspect of her voice that led her friend Tito Gobbi (who sang with her in Tosca) to call it una grande vociaccia, which I translate in my schoolboy Italian as meaning something like “a big ugly voice”. That isn’t meant to be as disparaging as it sounds (Gobbi was a great admirer of Callas’ singing). Having listened to lots of recordings of Maria Callas I have to admit that they are certainly not all good. Sometimes the voice didn’t come off at all. Unkindly, one colleague said that she “sang with her ovaries”. When she talked about her own noice, Callas herself often referred to it as if it were some independent creature over which she had very little control. Anyway, whatever the reason, when she was bad she was definitely bad. But I adopt the philosophy that one should judge artists (and scientists, for that matter) by their best work rather than their worst, and when Callas was good she was simply phenomenal, like a sublime and irresistible force of nature. That’s why they called her La Divina. Although her talent was very raw in the beginning there was no question that she always had a voice of exceptional power and dramatic intensity. When she started singing professionally she immediately attracted lavish praise from the critics not just for her voice but also for her acting. As a young soprano she sang in an astonishing variety of operas, including Wagner‘s Tristan und Isolde and Die Walküre, neither of which one would now associate with Callas. It was in the late 194os that Callas began to take an interest in the type of opera that would really make her name. Bel canto opera was rather unfashionable at that time, probably because audiences preferred the grittier and more realistic verismo style. Virtually single-handed, Callas resurrected the bel canto canon by injecting a true sense of drama into works which had previously just been seen as vehicles for the singers to demonstrate their art. 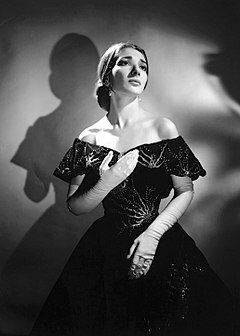 Callas brought an entirely new dimension to the great operas by Bellini (Norma, I Puritani, La Somnambula…) and Donizetti (Lucia di Lammermoor, Anna Bolena), although she was sufficiently versatile to also perform brilliantly in the verismo syle of Verdi and Puccini as well as lesser known composers such as Giordano (Andrea Chenier). Recordings of many of these performances are available, but it is sad that this glorious period of her singing career happened just a bit before high quality equipment was available so the true glory of her voice isn’t always evident. In 1953, Callas decided that she wanted to change her appearance, perhaps so she would look more appropriate for the parts she was playing on stage. At the time she weighed almost 200lbs. In order to lose weight as quickly as possible, she followed the barbarous but highly effective expedient of swallowing a tapeworm. She lost 80lbs in a matter of months. The dramatic loss of weight changed her body and her face, emphasizing her high angular cheekbones and giving her a striking look very well suited to the opera stage. But it also affected her voice somewhat, especially at the upper end where she seems to have found it more difficult to avoid the dreaded “wobble” which was one of the alleged imperfections that critics tended to dwell upon. Callas also had very poor eyesight which required her to wear very thick spectacles in order to see at all, a thing she refused to do onstage with the result that she was virtually blind during performances. In fact, during a performance of Tosca at Covent Garden she leant too far over a candle and her hair caught fire. Improvising magnificently, Tito Gobbi, as the loathsome Scarpia, extinguished the fire by throwing water at her before the audience had noticed. Although they weren’t much use for seeing with, her eyes were a great asset for her acting, in turns flashing like a demon then shining like an angel. After her weight loss, Callas was suddenly no longer just a wonderful singer but also a strikingly beautiful woman. Her career took a back seat as she started to revel in the glamorous lifestyle that opened up in front of her. Her voice deteriorated and she performed rather less frequently. Eventually she embarked on a love affair with Aristotle Onassis, a notorious serial collector of trophy women. She hoped to marry him but he abandoned her to marry Jackie Kennedy, widow of John F. Kennedy. She never really recovered from the failure of this affair, retired from singing and lived out the last years of her life as a virtual recluse in her apartment in Paris. She died in 1977. I had heard a lot about Maria Callas when I was younger, but the recordings that I listened to (generally from the 1960s) were really not very good as her voice was undoubtedly much diminished by then. I just assumed that, as is the case with many artists, the legend of Callas was all mere hype. Then, about fifteen years ago, I was listening to BBC Radio 3 and they played the final scenes of the great 1954 recording of Norma with Callas in the title role, conducted by Tullio Serafin. I was completely overwhelmed by it and tears flowed freely from my eyes. I’ve always had a tendency to blub when I hear really beautiful music, but as I’ve got older I’ve learned not to be embarrassed by it. At least I don’t cry at football matches. In England, Callas is probably best remembered for her performances in Tosca in Covent Garden. I have recordings of her in that role and they are really wonderful. But there are many fine recordings of Tosca by other singers, some of which are almost as good. In the case of Norma, though, there isn’t any other performance that comes within a mile of the Callas version. Or if there is, I’ve yet to hear it. Now I know that there are some people, even opera lovers, who just don’t get Callas at all (just look at the comment boards on Youtube). I grant that she wasn’t always the most accurate singer, and I don’t think you could say her voice had a purely classical beauty. But even if you don’t like her voice you have to admit that she revitalized the opera stage and brought a new public into the theatres. I can’t imagine what the state of opera would be now, if there hadn’t been a Callas and you can’t argue that she is now an iconic figure. What I admire most about her is that, like it or loath it, her voice is instantly recognisable. In this sense, she always puts me in mind of a kind of operatic version of Billie Holliday. She’s a far cry from the many bland mediocrities that pass themselves off as opera singers nowadays. I’m going to end with the obligatory clips from Youtube. There’s a lot of Callas on there, not all of it good. I’ve chosen a couple of items, although neither of them has a proper video. The first was performed live in 1955 in front of the notoriously difficult audience at La Scala in Milan and recorded from a radio broadcast so that the sound quality is quite poor. A studio recording of this aria, from Andrea Chenier, features most movingly in the film Philadelphia. This live version, however, is notable for a number of reasons. One is that you get some idea of the power of the Callas voice in the way she pushes aside the entire orchestra and is even able to cut through the distortions introduced by the rather primitive recording technology. The second thing is that she sings it so beautifully, with such feeling, lovely phrasing, and so much colour and vitality. Listen to the way the texture of her voice matches perfectly her changing emotions as she tells her story. The shattering, climactic high C that occurs near the end is a perfect example of what I was saying above. She stabs this note out like her life depended on it. It sends shivers down my spine and clearly had the same effect on the audience. The thunderous applause that follows the end of this aria is quite frightening in its intensity, but gives a good idea how much her public adored her. If you can put up with the lo-fi recording, this is certainly a better performance than the studio version. The final piece has to be from Norma. I think Bellini is a wonderful composer of opera, but he doesn’t make life easy for the singers. There’s never any doubling of the vocal line by the orchestra so the singer is very exposed. This doesn’t bother Maria Callas. This is the famous aria Casta Diva, which has become a kind of signature tune for her and it’s one of the pieces that she always seemed to perform beautifully. It might be a bit hackneyed but I love it and, after all, it’s my blog. There’s also a nice compilation of pictures. I’d be interested to hear what the general opinion of Callas is based on a sample of the two or three people who read my blog, so please feel free to add your comments! 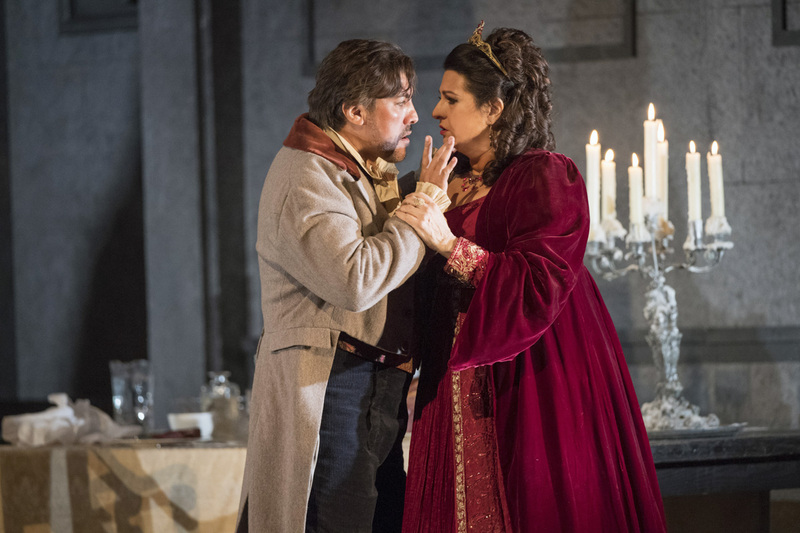 My current schedule takes me back and forth across the Irish Sea, making it a bit of challenge to take in as many musical events as I’d like to, but I did manage to get to see yesterday’s performance of Tosca at Welsh National Opera. I don’t usually go for afternoon performances, but this was basically my option. Not surprisingly there was a packed house in the Wales Millennium Centre for a tale of jealousy and murder set to gorgeous music by Giacomo Puccini. Tosca is an opera in three acts (which means two intervals wine breaks…). It’s a melodrama, and is set in Rome in 1800. Each act takes place in a very specific location within the Eternal City. Act I is in the Church of Sant’Andrea della Valle, Act II in the Palazzo Farnese, and the final denouement of Act III takes place among the battlements at the top of the Castel Sant’ Angelo overlooking the Tiber. The setting is so specific to time and place that it resists being monkeyed about with, done in modern dress, staged in a chip shop or whatever. Thankfully, Michael Blakemore’s production (of which this is a revival) is very firmly of the period and location required. As a longstanding opera bore, I have to admit that I have been on a Tosca pilgrimage and have visited all three locations in Rome. The scenery used in last night’s performance isn’t exactly as the real locations but it definitely evokes them very well. Floria Tosca (Claire Rutter) is a celebrated opera singer who is in love with an artist (and political radical) by the name of Mario Cavaradossi (Hector Sandoval), who helps to hide an escaped political prisoner while working on a painting in Act I. The odious Baron Scarpia (Mark Doss), Chief of Police, comes looking for the convict and decides to catch Tosca and Cavaradossi too. He lusts after Tosca and hates Cavaradossi. In Act II, we find Scarpia at home eating dinner for one while Cavaradossi is being tortured in order to find out the location of the escapee. Tosca turns up to plead for his life, but she hasn’t bargained with the true depths of Scarpia’s depravity. He wants to have his way with her, and to put pressure on he lets her listen to the sound of her lover being tortured. She finally consents, in return for Scarpia’s promise to let Cavaradossi go and grant free passage to the two of them. This he seems to do, but while she is waiting for him to write the letter of conduct she sees a knife. Instead of letting Scarpia defile her, she grabs it and stabs him to death. Act III begins with Cavaradossi facing execution, sure he is about to die. Tosca is convinced that this is just a charade and that Scarpia ordered them to pretend to shoot Cavaradossi so he wouldn’t look like he was being merciful, which would be out of character. The firing squad fire and Cavaradossi falls. But it was no fake. He is dead. Tosca is distraught and bewildered. Shouts offstage reveal that the police have found Scarpia’s body and that Tosca must have murdered him. To avoid capture she hurls herself from the battlements. Her last words are “O Scarpia, avanti a Dio!” – “I’ll meet you before God, Scarpia”. Hector Sandoval (Cavaradossi) and Claire Rutter (Tosca). 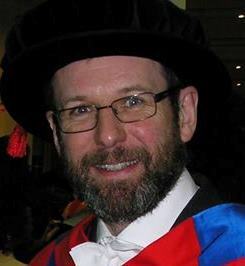 Picture credit: WNO. The opera wasn’t particularly well received when it was first performed in 1900, being famously described by one critic as “a shabby little shocker”, but it has become a firm favourite with audiences around the world and is now acknowledged as a masterpiece of music drama. So how did Puccini manage to transform a penny-dreadful plot into a great work of art? I don’t think it’s hard to see why it works so well. First and foremost, there’s the music, which is wonderful throughout, but it is always plays an essential part in keeping everything moving. Of course there are the great arias: Vissi d’arte, Vissi d’amore sung by Tosca in Act II and E Lucevan le Stelle from Act III, sung by Cavaradossi; but even apart from those tremendous set-pieces, Puccini uses the music to draw out the psychology of the characters and underline the drama. Although not usually associated with the use of leitmotifs, Puccini deploys them throughout: Scarpia’s arrival is announced with a suitably menacing theme that recurs whenever he is present or even just referred to. This theme is actually the first thing we hear as the Opera starts. It also plays Scarpia out at the end of Act 1 when he sings his magnificently chilling Va Tosca over a setting of the Te Deum. Time does stand still for Tosca’s great Act II aria, the dramatic fulcrum of the Opera, but that just emphasises the pace of the rest of the piece. This is a work with no spare flesh or padding anywhere, and a perfect interplay between music and action. The moment when Tosca sees the knife with which she will kill Scarpia is signalled by the orchestra. And that leads to the second point. Each of the three principals could have been very two-dimensional: Cavaradossi the good guy. ; Scarpia the bad guy; Tosca the love interest. But all the characters have real credibility and depth. Cavaradossi is brave and generous, but he succumbs to despair before his death. No superhero this, just a man. Scarpia is a nasty piece of work all right, but at times he is pathetic and vulnerable. He is monstrous, but one is left with the impression that something made him monstrous. And then there’s Tosca, proud and jealous, loving but at the same time capable of violence and spite. It is a truly shocking moment when she kills Scarpia. In this production, she doesn’t just stab him once: she chases him around the room repeatedly plunging the knife into him, then stands over him as he begs for help. There’s no attempt to sanitise the violence of his death. It’s all so real. I guess that’s why this type of opera is called Verismo! Top marks for the Orchestra of Welsh National Opera, under the direction of Carlo Rizzi, who did full justice to Puccini’s magnificent score. Claire Rutter has a fine voice for the role, and I thought Hector Sandoval sang and acted wonderfully. The big numbers in Tosca are quite familiar, but they still sounded fresh and were performed with great feeling. Best of all, Mark Doss has a dark baritone voice that gave Scarpia a tremendous sense of power and danger. He even got a few pantomime boos at the end. The picture was taken (by Megan Davies) outside The Small Bar in Cardiff after a celebratory tipple. So yes, it’s been a good day..
After yesterday’s examiners meeting at Queen Mary I downed a quick beer and took the tube to the West End in order to meet up with a couple of friends (Joao and Kim) to see last night’s production of Tosca at the Royal Opera House at Covent Garden. Just over a year ago I posted about Welsh National Opera’s Tosca here in Cardiff, so I’ll refer you there for details about the plot synposis and background. Let me just say even though the WNO production was very good, it’s very difficult to match the special atmosphere of Covent Garden. It’s such a famous venue but at the same time is so intimate. I’d forgotten just how close you get to the stage. The prices were special prices too! Our tickets were £220 each and drinks in the two intervals were eye-wateringly expensive. But then you don’t go to Covent Garden for a cheap night out. This was the only night that I could make it to this run, and as a result we actually saw the “second” cast: no Bryn Terfel, no Angela Gherghiou, and as it happens to Marcello Giordani either (owing to illness). In the performance we saw, Floria Tosca was Martina Serafin, Baron Scarpia was Juha Uusitalo, and making his Covent Garden debut as understudy thanks to Giordiani’s indisposition was was the young tenor Giancarlo Monsalve as Cavaradossi. I wasn’t too disappointed not to see Angela Gheorghiou, as I think she’s quite overrated, but I would have loved to have seen Bryn Terfel’s Scarpia. Perhaps some other time. Anyway, it was a thoroughly enjoyable production if perhaps lacking that extra sparkle that the headline cast might have supplied. Serafin took a while to get going but from Act II onwards was very good, although she never quite managed to get across the fiery unpredictable side of her character’s persona. Uusitalo was a brutish Scarpia with a strong stage presence; the dashing Monsalve took his opportunity well and was warmly received by the full house. I’ve often wondered how this Opera, which on the face of it is a straightforward melodrama, manages to work so well. I think part of its magic is that the characters, as is often the case with Puccini, are not quite what they seem. Tosca is the heroine but she’s far from Snow White. She’s jealous and temperamental and in many ways quite unattractive. In this production, after initially stabbing Scarpia in self-defence, she carries on stabbing him in a kind of bloodlust which is quite scary. Cavaradossi is the hero, but he’s not a particularly heroic hero because he crumbles under the strain of his imminent execution in Act III. And then there’s Scarpia, the baddy. I find him the most fascinating of all because, although he’s evil, there are flashes of loneliness and contrition. I think he’s monstrous because something in his past has made him monstrous. A prequel to Tosca based on Scarpia’s earlier biography would make a very interesting opera indeed.. I know it’s deeply unfair to make comparisons, but I thought nevertheless I’d include this clip of a live broadcast of Tosca from the same venue, way back in 1964, featuring perhaps the greatest Scarpia, Tito Gobbi, and perhaps the greatest Tosca, Maria Callas. I heard the composer Michael Berkeley talking about what a revelation it was to see Callas at Covent Garden in this role; he simply hadn’t imagined that acting in the opera could be so good. Even in black-and-white you can get idea of the mesmerising stage presence that was Maria Callas and what a fine actress she was. Here she is, with hatred burning in her eyes, plunging the knife into Scarpia, standing over him willing him to die, then realising what she has done, turning back into a frightened, vulnerable and remorseful woman then doing the best she can to pay respect to his dead body. Magnificent. I’ve been so busy over the last couple of weeks that I almost forgot that the current run of Tosca at Welsh National Opera was about to come to an end without me having seen it. Nightmare. I suddenly remembered on Thursday that yesterday’s performance was the last one in Cardiff, but I managed to get tickets just in the nick of time. Unsurprisingly, there was a packed house in the Wales Millennium Centre last night; we were treated to an evening of jealousy and murder set to gorgeous music by Giacomo Puccini. Tosca is an opera in three acts (which means two intervals, glug glug..). It’s basically a melodrama, and is set in Rome in 1800. Each act takes place in a very specific location within the eternal city. Act I is in the Church of Sant’Andrea della Valle, Act II in the Palazzo Farnese, and the final denouement of Act III takes place among the battlements at the top of the Castel Sant’ Angelo overlooking the Tiber. The setting is so specific to time and place that it resists being monkeyed about with, done in modern dress, staged in a chip shop or whatever. Thankfully, Michael Blakemore’s production (of which this is a revival) is very firmly of the period and location required. As a longstanding opera bore, I have to admit that I have been on a Tosca pilgrimage and have visited all three locations in Rome. The scenery used in last night’s performance isn’t exactly as the real locations but it definitely evokes them very well. Floria Tosca (Elisabete Matos) is a celebrated opera singer who is in love with an artist (and political radical) by the name of Mario Cavaradossi (Geraint Dodd), who helps to hide an escaped political prisoner while working on a painting in Act I. The odious Baron Scarpia (Robert Hayward), chief of police, comes looking for the convict and decides to catch Tosca and Cavaradossi too. He lusts after Tosca and hates Cavaradossi. In Act II, we find Scarpia at home eating dinner for one while Cavaradossi is being tortured in order to find out the location of the escapee. Tosca turns up to plead for his life, but she hasn’t bargained with the true depths of Scarpia’s depravity. He wants to have his way with her, and to put pressure on he lets her listen to the sound of her lover being tortured. She finally consents, in return for Scarpia’s promise to let Cavaradossi go and grant free passage to the two of them. This he seems to do, but while she is waiting for him to write the letter of conduct she sees a knife. Instead of letting Scarpia defile her, she grabs it and stabs him to death. Act III begins with Cavaradossi facing execution, sure he is about to die. Tosca is convinced that this is just a charade and that Scarpia ordered them to pretend to shoot Cavaradossi so he wouldn’t look like he was being merciful, which would be out of character. The firing squad fire and Cavaradossi falls. But it was no fake. He is dead. Tosca is distraught and bewildered. Shouts offstage reveal that the police have found Scarpia’s body and that Tosca must have murdered him. To avoid capture she hurls herself from the battlements. Her last words are “O Scarpia, avanti a Dio!” – I’ll meet you before God, Scarpia. The opera wasn’t particularly well received when it was first performed in 1900, being famously described by one critic as “a shabby little shocker”. I think the secret of its success is twofold. First and foremost the music is wonderful throughout. Of course there are the great arias: Vissi d’arte, Vissi d’amore sung by Tosca in Act II and E Lucevan le Stelle from Act III, sung by Cavaradossi; but even apart from those tremendous set-pieces, Puccini uses the music to draw out the psychology of the characters. And that leads to the second point. Each of the three principals could have been very two-dimensional. Cavaradossi the good guy. Scarpia the bad guy. Tosca the love interest. But all the characters have real credibility and depth. Cavaradossi is brave and generous, but he succumbs to despair before his death. No superhero this, just a man. Scarpia is a nasty piece of work all right, but at times he is pathetic and vulnerable. He is monstrous, but one is left with the impression that something made him monstrous. And then there’s Tosca, proud and jealous, loving but at the same time capable of violence and spite. They’re all so real. I guess that’s why this type of opera is called Verismo! The orchestra and cast were excellent. Elisabete Matos has a fine voice for the role, and also managed to spit venom at Scarpia in authentic fashion. Geraint Dodd sang wonderfully, I thought. E Lucevan le Stelle is done so often that it’s difficult to make it fresh but his rendition was overwhelmingly emotional. Best of all, Robert Hayward has a dark baritone voice that gave Scarpia a tremendous sense of power and danger. The only problem with the performance was right at the end. Elisabete Matos didn’t appear on cue for her curtain call. I was baffled. Eventually she appeared on stage, helped by a member of the backstage team. She looked very unwell and was clutching her ribs. I think she must have landed badly after her fall from the battlements. I hope she’s not badly hurt. Whoever was responsible for health and safety might be for the firing squad themselves. I missed an important anniversary this week. Had she still been alive, December 2nd 2008 would have been the 85th birthday of the most renowned opera singer of her time, Maria Callas.